Your organization is provided with a dedicated 10-digit number. Text donations are sent to your dedicated 10-digit number where they are received and processed by Vanco. 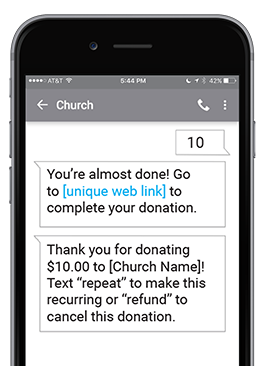 How will the church know when a text donation is made? Text donations will appear on Vanco’s standard processing reports along with all other transactions. Members receive immediate confirmation via text and email that their donation was received. After a text donation has been processed, it appears on the member’s credit card or bank statement. No. Donations are processed using the payment method specified in the member’s online profile. Phone carriers handle only the text message, never any financial information.